Rafe (Ben Affleck) and Danny (Josh Hartnett) were best mates through childhood, and ended up fighter pilots together in the US military. Rafe met a nurse, Evelyn (Kate Beckinsale) and fell in love, but then went to Europe to fight for the allies. It seemed he was dead, then Evelyn fell in love with Danny. But, Rafe turns up and things get bit awkward. Luckily, before anyone has to deal with their feelings, the Japanese attack Pearl Harbor and everyone is a bit busy. At the end of the attack, heaps of people are dead, but not Danny, Rafe or Evelyn. So they still need to deal with their issues. But then there is more. There are heaps of films I haven’t seen but intend to for a variety of reasons. 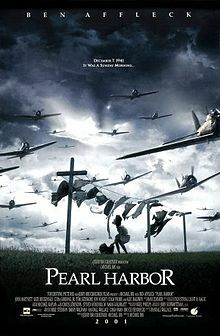 For me, Pearl Harbor was one, purely because it has a reputation for being a terrible film. And oh, it is so terrible! There is a pretty fabulous cast, Alec Baldwin, Ben Affleck, Josh Hartnett, Kate Beckinsale, Ewen Bremner, Jennifer Garner, Jon Voight, Michael Shannon, Dan Ackroyd, Tom Sizemore, Cuba Gooding Jnr… And there are some pretty fabulous special effects. But I guess, with all they spent on all of that, they should have spent a bit more on scripting. It goes from being extremely average to being just plain terrible.